The nine-game road trip does not end today, but the six-game West Coast swing does. After dropping two of three in Oakland (bah), the Yankees have won the first two games in Seattle (yay), so this afternoon they have a chance to finish the three-game sweep that would more or less close the door on the Mariners’ postseason hopes. At one point the Mariners were 7.5 games up on a postseason spot. Now they’re 7.5 games back. Rough. It is cool, cloudy, and rainy in Seattle today. The Safeco Field roof should be closed. This afternoon’s first pitch is scheduled for 4:10pm ET. YES will have the broadcast. Enjoy the game, folks. 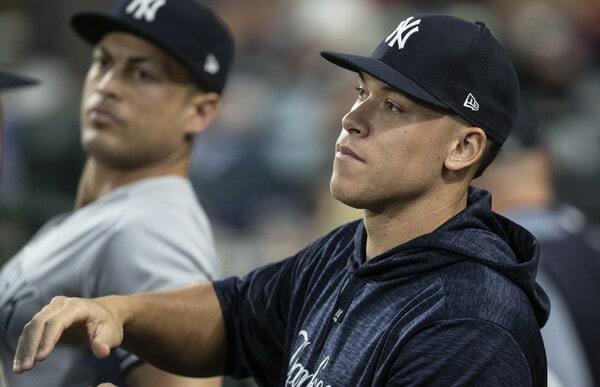 Injury Updates: Aaron Judge (wrist) continues to progress with no issues and could take full on-field batting practice during the upcoming series with the Twins this week. If that happens, it seems like there might be a chance Judge could join Triple-A Scranton for some rehab games before the end of their postseason … Didi Gregorius (heel) is okay. The Yankees are just taking it slow in his return from the disabled list because he didn’t play in any rehab games. Rotation Update: Sonny Gray is listed as the starter for Tuesday’s game against in Minnesota. It’ll be J.A. Happ on Monday, Gray on Tuesday, and Luis Severino on Wednesday. The Yankees are using Gray as a spot starter to give Luis Severino an extra day between starts. I kinda wish they’d skip that start entirely. Alas. Minor League Update: Don’t wait around for the daily DotF post today, folks. There won’t be one. There are no minor league games today. Triple-A Scranton clinched a spot in the International League Championship Series last night, and the series doesn’t begin until Tuesday. All the other minor league affiliates are done playing. DotF will return Tuesday as the RailRiders look to win their second Governor’s Cup in three years.